You don’t need to read the Lancet to know that heatwaves aren’t great for health. Even without the terror of fires, excess heat is linked with deaths, especially in the elderly. On the bright side, however, when the thermometer soars and it’s too hot to move, few things are more delicious than settling in a shady spot to get lost in a book. Yes, I have heard of ice cream, but a novel occupies the mind for longer than a raspberry ripple, and that’s got to be a bonus in the current mess the world is in. Writers are doubly blessed in a heatwave. For a start, they may be able to work at home with next to nothing on, which is so far removed from struggling on the Tube wearing office attire that it’s almost like not working. As a plus, there are often cool places to sit with pencil or laptop. I’m assuming that the nice cool place isn’t in full view of the neighbours. Then again, think of all the publicity, as a fellow writer reminds me. Best of all, though, scorching weather presents excellent material for fiction. Author Helena Halme mentions just this in her recent blog post Five Books for a Heatwave. I’d like to unpick this a little more. Summertime is in itself magical, with ice lollies, flip-flops, sandcastles, and grandparents moaning about the lack of rain. In school holidays gone by, every summer was long and hot, at least in the memory. With normal life suspended, there’s an illusion of freedom, Swallows and Amazons style. The heat does things to people’s pheromones. Well, I’m assuming it does, though the only paper I’ve seen is based on research on insects. At any rate, the brain seems to fry at high temperatures. Even the most impassive person can become, well, hot-headed and behave erratically, which is all good news for novelists. The human mind isn’t the only thing to abandon normal function in a heatwave. By now, most people in the UK are familiar with buckled rails and cancelled trains. In the northeast last month, a man became trapped when tarmac melted and his leg literally sank into the road surface. This happened in Heaton (no, I’m not kidding) and firefighters were called to free him. But these phenomena are as nothing compared to the image of Jesus appearing on a ceramic drainpipe in Joanna Cannon’s debut novel The Trouble with Goats and Sheep. This unusual manifestation of Christ brings out the neighbours and their deck chairs, and becomes a turning point in the story. Every heatwave seems to leave its own particular memories. The legendary summer of 1976 featured beaches covered in ladybirds, exhortations to share a bath with a friend, and other references that can date-stamp a novel, as both Joanna Cannon and Maggie O’Farrell demonstrate. While there’s no exact definition of a heatwave, meteorologists often consider it to be an increase of 5⁰C above the average maximum temperature for five days or more – with the average maximum temperature being between 1961 and 1990. The great heatwave years of the UK include 1911, 1955, 1976, and 1983. Speaking for myself, I have a soft spot for 2013 which broke few records but did produce the hottest July for many years. This is the year in which I set my novel Hampstead Fever, and it also happens to be when I got married. Whether you’re reading or writing, I hope you enjoy the rest of this scorching season. How will you most remember the heatwave of 2018 when it gives way to wind and rain? 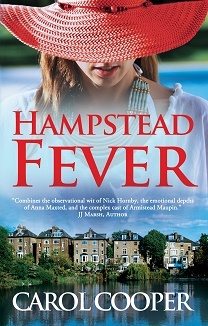 PS You can find Hampstead Fever in all the usual places. Something strange has happened to me lately. Even as a young child, I could concentrate for hours. But, as an adult, which I should be quite good at being, what with the length of time I’ve had to get it right, I can’t focus on any one thing for more than a few minutes. And then I promptly forget it. In short, I have the attention span of a gnat. A rather undisciplined gnat, at that. Would a social media detox help my powers of concentration? I’ve talked to a lot of people who’ve taken a break from social media, like fellow author Helena Halme who had a two-week holiday from her online world last year. My conclusion is that, freed from the constant babble of digital life, most people seem to feel a lot sharper and more refreshed afterwards. So I’m planning to detox too. A short period of time without constantly checking social media, or dropping everything when I get a notification, will, I hope, help me focus on the things that really matter. I won’t miss Facebook. Yes, it’s nice to post my photos, keep up other people’s news, and be part of some groups. But, while I enjoy the occasional dictation of pictures of babies or kittens, I don’t need time-sapping quizzes like Who is Your BBC Husband? Besides, Grantchester is an ITV programme. And I can do without exhaustive posts about strange symptoms which doctors haven’t been able to cure in a decade or more. Yes, there may be a need to share the frustration of having unexplained problems, but (call me biased) I can’t see how asking a bunch of non-medical people for their opinions will help, especially when most of them have never even met you. Living without Facebook Messenger may prove tricky for me, though. It’s my main means of communicating with one of my sons. Remember when mobile phones only did phone calls? Well, that’s what my son still has. His beloved mobile is so retro that it doesn’t do texts, photos, or even voicemail. Which would be fine, if he actually answered my calls. Hence Messenger. A detox will also mean dispensing with WhatsApp, which is the principal way my two other sons and I keep in touch. Here’s the kind of vital communication they will be missing. I may yearn for Instagram too. What will my day be like if I can’t post photos from my iPhone, or share my progress in Jenn Ashworth’s challenge of #100daysofwriting? I won’t be able to see the Colour File’s fabulous daily posts, or pictures of eye-popping holiday destinations (talking about you, Deborah Cicurel). On the plus side, I may actually do some writing. My blood pressure would probably improve without Twitter. It’s not just the constant unspoken drive for likes, retweets, comments, and follows, or the fact that it’s tough to be nuanced in 140 characters. It’s drivel like this. Without social media, there’ll be more chance to live in the moment, as per Marcus Aurelius’s dicta. I will be able to dwell on the beauty of life without the immediate need to post a photo of it. You never know, I may even reconnect with simple pleasures: smelling roses, pressing flowers, that kind of thing. My husband and I might even have an actual conversation. Once free of the pressure to share every moment, however insignificant, I hope that my brain will recover, and that I will become more productive. That’s the idea, anyway. But I’m not looking forward to those three hours without my mobile. Have you taken a deliberate break from social media? And what did you miss most? I’d love to hear. It’s wonderful being an author. While there’s rarely much money in it, you get to do what you love. It’s probably the most fun you can have with your clothes on. There’s also the sheer joy of opening a box full of copies of your shiny brand-new book. That, as novelist Helena Halme points out, never gets any less exciting. And it’s a thrill meeting readers and getting feedback, especially when you find out your words have made a real difference. Well, yes, the author generally is published. Otherwise they’d probably not call themselves an author. As for hearing of that person, it depends. I know several people who never heard of Kahlil Gibran, yet his book The Prophet sold tens of millions of copies. If it were that easy, I think we’d all be knocking on Hollywood’s door. It’s not, which is why, until we get the call, we’re selling our books at around £7.99 a pop (or less; usually much less for the ebook). Not quite a direct route to the Walk of Fame. The implication is that their life is far busier than the author’s, and that no talent is required. Usually uttered by someone who’s never even written a shopping list. See 4. Because writing books is some romantic thing that just happens when you click your heels and make a wish. It’s not like it’s a proper job, right? Because, obviously, authors are happy to work for free. Many thanks to my fellow writers, especially Vivien Hampshire and Georgina Penney, both from the Romantic Novelists’ Association. If you ever meet one of us, you know what not to say. Just How Fictional is Fiction? There’s a socking great disclaimer at the front of my novels. The real bits should be obvious. All you have to do is check out Marylebone, or amble down Hampstead High Street. I’ve made up almost all the rest. Not that readers believe authors’ protestations. Friends and family are apt to dissect published novels with an eye on ‘real life’. Even Ian Fleming, I’m told, suffered from this problem. People don’t just ask “Am I in it?” They go straight for “Which character am I?” I have half a dozen friends who believe they’re the single mother from One Night at the Jacaranda, and one who still thinks she’s the femme fatale. “I’m Geoff,” insists my husband Jeremy. He has no discernible similarities with the doctor in my novels, though someone did once call him Geoffrey by mistake at a party. Of course authors draw on reality when inventing their stories. Jane Davis says her favourite description of fiction is ‘made-up truth’. Her next book My Counterfeit Self was inspired by the plight of UK atomic war veterans. She even mentions many of them by name, but her book is still made up, and all the better for it, in my opinion. Finnish author Helena Halme also uses the truth as a springboard for fiction. Her romantic series The Englishman is based on her own life story of meeting her Navy husband and moving to the UK. The prequel The Finnish Girl is now out, but, like the others in the series, reality has been fictionalized to provide the right pace and tension for a novel. Fiction certainly benefits from an injection of fact. That’s what makes it relatable. I lost all faith in a story where the NHS doctor ‘worked shifts’. In those days, hospital doctors often worked a one-in-two rota. Going to work on Friday morning and not leaving till Monday evening was called many things, but a ‘shift’ it was not. A novelist invents stuff, but it needs to be right. While I can’t define ‘right’, I had to make that call with the image on the front of my forthcoming novel Hampstead Fever. Cover designer Jessica Bell suggested adding a little red boat to the pond. The flash of red on the water seemed a delightful counterpoint to the red hat and red lipstick. But the pond in question is Hampstead Heath’s Number One Pond. Luckily one my sons, a local councillor, knows all about Hampstead’s ponds. As he explained, only the Model Boating Pond is a model boating pond. Cute as it was, my little boat had to be hauled out of the water.